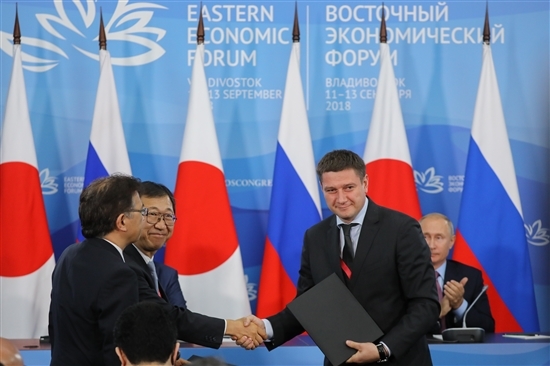 The Skolkovo Foundation signed a memorandum of understanding with Japan’s IoT Acceleration Consortium on the eve of the Eastern Economic Forum, following talks between Russian President Vladimir Putin and Japanese Prime Minister Shinzō Abe in Russia’s Far Eastern port city of Vladivostok. The agreement with the Japanese consortium was signed on behalf of the Skolkovo Foundation by Yury Saprykin, vice president for regional and international development (right). Photo: Roscongress Foundation. The IoT Acceleration Consortium aims to foster the development of technologies related to the Internet of Things, big data and artificial intelligence: all topics of discussion at the Eastern Economic Forum, which opened on Tuesday and runs through September 13 in Vladivostok. The Skolkovo Foundation traditionally plays an active role in the annual forum – aimed at contributing to the growth of the Far East and to closer cooperation between Russia and the Asia-Pacific region – through the foundation’s Far East office, located on the campus of the Far Eastern Federal University (FEFU). At last year’s forum, the Skolkovo Foundation and FEFU launched a joint project: the Russky Technopark. 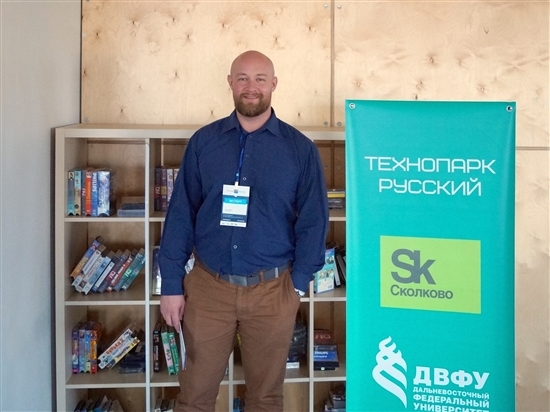 In the last year, nearly 60 startups have become residents of the technopark, which for now concentrates more on the range of services it offers than physical infrastructure, says Ilya Mirin, head of the Skolkovo Foundation’s Far East branch. “Our colleagues have short-term plans to prepare a pilot space, and the long-term plan is the design and then construction of a Technopark on Russky Island as part of the second stage of construction of the FEFU campus,” Mirin told Sk.ru ahead of this year’s forum. Ilya Mirin, head of the Skolkovo Foundation's Far East office. Photo: Sk.ru. Cooperation between Skolkovo and the university on this project is very productive, Mirin told Sk.ru. “Our colleagues listen attentively to the requests and wishes of the Skolkovo Foundation’s Far East residents that we introduce them to. Three teams from among the foundation’s Far East residents are at various stages of partnership with the Russky Technopark: Far Eastern Peat Company, Rhonda Software and ROBOT,” he said. Representatives of several Skolkovo teams from the European part of Russia are attending the Eastern Economic Forum with an interest in gaining a foothold in the Primorye region via the Russky Technopark, and using Vladivostok as a springboard to develop their business beyond the Ural Mountains, said Mirin, adding that Kirill Kaem, senior vice-president of the Skolkovo Foundation, is taking part in the business programme of the forum. The work of resident companies of Russky Technopark will be exhibited at the forum, of which four are Skolkovo companies, including ROBOT, which will demonstrate its robot Adam, a programmable android designed for educational purposes and research. Skolkovo's Far East office is also helping to organise the youth part of the Eastern Economic Forum, including a pavilion of hi-tech projects and innovations in operation in the Far East and designed by entrepreneurs under 35 years old. The youth forum will also feature lectures and master classes from leaders of tech companies, as well as sessions devoted to new markets and new trends in IT, robotics and biotech. Delegations from more than 60 countries are taking part in this year’s Eastern Economic Forum. The Russian government has made concerted efforts to develop the Far East region in recent years, launching a ministry specifically for that purpose. The Far Eastern Federal University campus was built for the Asia-Pacific Economic Cooperation forum that Russia hosted in 2012, when the world’s longest cable-stayed bridge over to Russky Island was also built. The Skolkovo Foundation opened its office in Vladivostok in 2015.